My cable/internet went out - got fixed but the cable guy said we have an electrical short. Outlets in two bathrooms are not working. Do we need an electrician or could it be something simple? …...could it be something simple? You mention it is the bathroom outlets that aren't working. They could be GFI outlets that stop working if there is a short. 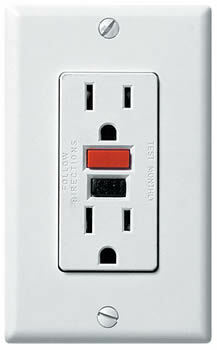 Depending on the age of the house the GFI could be at the outlets or in a newer home they could be at the breaker box. The first thing you need to do is track down where the GFI breaker is. This is what a GFI outlet looks like. Simply push in the red button to reset it. If the plugs in the bathroom don't look like that then the GFI might be in your breaker box. Find the breaker and try turning it off and on. If it blows again then you have a problem somewhere that will need to be tracked down. An electrician is probably needed at that point since the problem could be anywhere.